I really insist on good quality, fresh and often organic ingredients for my classes. We use my own olive oil (the fruit of the olive trees surrounding our property, “La GrangeVieille”). The Côtes du Rhône wines that accompany the meals are produced by my father from the estate “Domaine de l’Amandine”, or from my brother’s estate “Domaine les Pialons”. 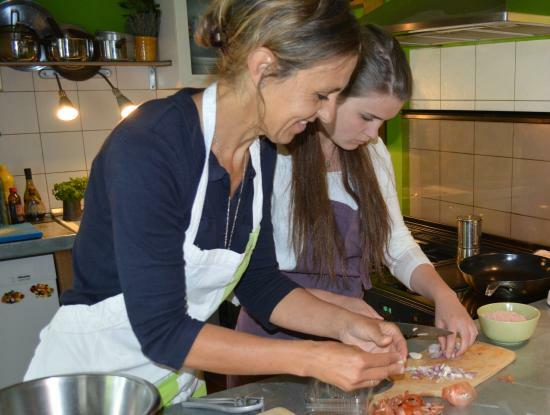 The cooking classes take place at “La Grange Vieille”, a beautiful restored 18th century “grange” or farmhouse, situated on a secluded hilltop with an arresting view of neighbouring vineyards and olive groves. The cooking classes start at 9.30a.m. at “La Grange Vieille” and run until 2.00p.m, and can also be done in the evenings from 5.30 p.m. We prepare the meal together and then sit down to share it on our veranda surrounded by vines and olive trees. Aprons are provided for the cooking classes and copies of the recipes (in English) are given to the participants, so that you can recreate these dishes back home for friends and family. Cooking courses are available every day from Monday to Friday..
My cooking classes are inspired by my love of Provence, my homeland, the land of olive trees, vineyards, sunshine and beautiful landscapes. Therefore, come and discover the rich provençal, culinary tradition handed down to me by my mother and my grandmother; a tradition that in its simplicity seeks to celebrate and give expression to the intense flavours and aromas of the local produce. All my recipes are comprised entirely of fresh local produce. The majority comes from our exceptional weekly market in nearby Vaison-la-Romaine; the fishmonger, Mr Lafont ; the butcher, Mr Pointu; the cheese merchant, Mr Berger and fresh fruit and vegetables from a local producer, Mme Ribaud, as well as from our own garden.